Ihave a 2001 Cadillac Eldorado ESC. A couple of years ago, I had an aftermarket autostart installed at circuit city. I believe it was a Cobra System. A few months ago, a went out to start my car and nothing. I kept trying to start it for a few minutes, and then it started, but then my check engine light came on. Then no problems for a month or more, then all of a sudden it would do it again. Noticed when I put the car into accessory, all power turned off to accessories. This morning, started the car and got message "security system failure, car may not restart". Do you know what may be the problem, and how much it would cost to fix it? Can this be handled by a mechanic other than the dealer? Your car has teh Passkey security system with the chip in the ignition key. Circuit City may have bypassed this system in order to get the remote start to work. What you will need to do is to insert the key into the igntion and measure resistance across the two white wires coming out of the steering column. They are encased in an orange insulation (see picture). Then measure resistance across the chip in the key itself. Both resistance measurements should be the same. Check the area of the wiring coming out of the column carefully. If they did bypass the system then the wiring could have a resistor spliced in at this point and may have a loose connection. Hi Dave, I need a little more info. Not too familiar with checking resistance. How do you check the resistence across the chip in the key itself. Do you just touch the meter to the chip in the key? Also, because there is a remote starter, does that mean that the starting components have been bypassed already so I would not need to replace any of those? If the resistances are different, then what? To measure resistance across the key touch the meter on the chip in the key. One meter lead to one side of the key and the other meter lead to the other side. If the resistance measurement is different then this could be a broken wire coming off the ignition lock cylinder inside the column. If the system has been bypassed then you would not need to worry about the wiring inside the column. You will need to check the area of the wiring coming out of the column for the bypass and to see if there are any loose wires in this location. This could cause the intermittent starting problem. Thanks Dave. that is helpful. 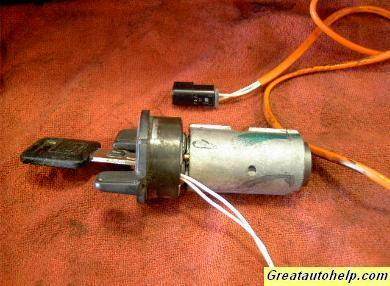 One last question, if it isn't a bad connection or a broken wire in the steering column, then what would you check next? Just in case I need to take this to a mechanic. If it is not a loose connection then the problem is likely going to be in the gauge cluster. The key chip info goes to the gauge cluster first and then the gauge cluster communicates with the engine control computer to disable starting. Cadillac Eldorado: MY 1997 Cadillac Eldorado is not starting!